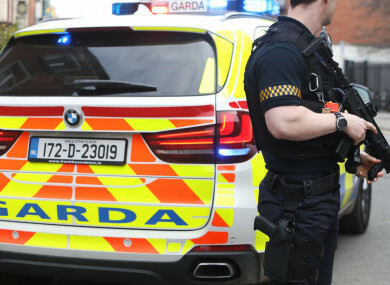 GARDAÍ BELIEVE THEY have saved the life of a man associated with the Hutch crime gang after officers arrested two men who were armed with a handgun. The men, who are well-known to gardaí, will continue to be quizzed in relation to the find this morning. They are heavily linked with the Kinahan crime gang. At around 5pm yesterday evening, gardaí attached to the Drugs and Organised Crime Bureau (DOCB) stopped a car on the Howth Road in Killester. It is understood that gardaí had conducted in-depth surveillance after receiving intelligence about the planned murder. Gardaí believe that the man has been previously targeted at least twice before by Kinahan gunmen. Sources have told TheJournal.ie that the man has been officially warned by gardaí that his life is under threat. He has refused to accept garda advice regarding his security. The target was a close friend of Jason ‘Buda’ Molyneux who was shot dead near the Five Lamps area of Dublin’s north inner city in January of this year. Assistant Commissioner John O’Driscoll said that gardaí continues to closely monitor the activity of people associated with organised crime groups with a view to protecting the life of their intended victims and to seize the proceeds of their criminal activity. The Assistant Commissioner with responsibility for Special Crime Operations added: “Personnel attached to Special Crime Operations (SCO) and the Garda National Drugs & Organised Crime Bureau (GNDOCB) in particular, supported by specialist units attached to Security & Intelligence, have again arrested suspects while in possession of a fully loaded handgun in circumstances where it is suspected that there was an intention to murder. Email “Hutch associate who survived previous attempts on his life was target of latest Kinahan murder attempt”. Feedback on “Hutch associate who survived previous attempts on his life was target of latest Kinahan murder attempt”.